”they applied the spray foam without any issues, despite the heavy winds, and we haven't had a leak since. Veritas Distributors was founded in 1983; they are a wine distributor, representing wines from all across the globe. Their distribution center is located in Warren, MI, along with their corporate offices. The building is a newer constructed building, with a combination of flat-roofing, and metal roofing. The warehouses are approximately 25,000 square feet and the offices about 10,000 square feet. Veritas had two roofing systems in need of repair. With a leaking flat roof on their warehouse and offices. They were also wasting energy because of poor insulation. Michigan has long and damaging winters, as such, snow accumulates, and due to poor insulation, it will melt from the heat in the building. This causes two problems, it creates Ice Dams in the gutters and drains reducing meltwater flow. The second problem is that is will crack the roof surface, penetrate in the seams of the roof, and leak into the building. As always, re-roofing with hot-tar or BUR would create astronomical costs, and disrupt building services, as all tear-offs do. 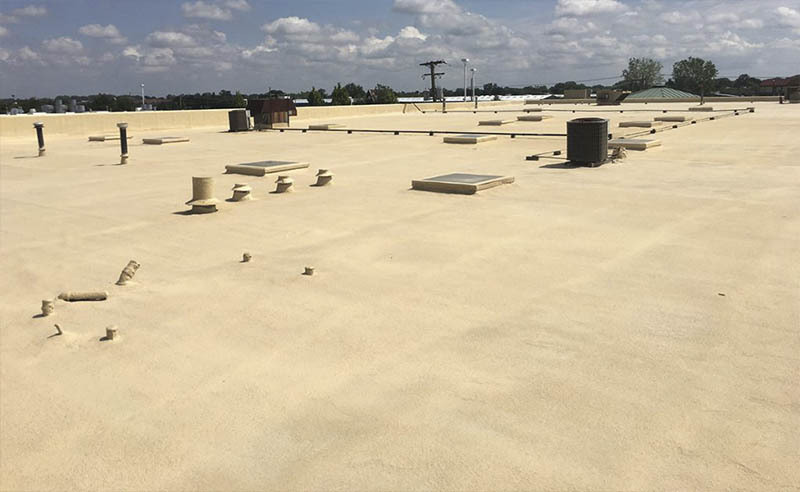 Energy Shield determined that our spray foam roofing system would work perfectly for Veritas, and eliminate the need to have a full-roof-tear-off. It would also insulate the building, eliminate Ice Dams, Thermal Drift, and stop any leaking. Spray foam roofing is a long-term solution reduces their energy costs. 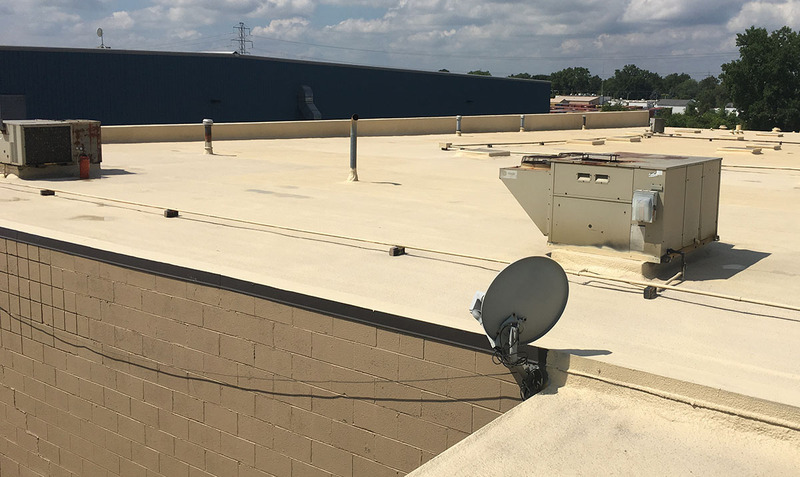 After installing the Sprayfoam roofing on their Offices, they were pleased with the results, and we began work on their warehouse. We ran into one hurdle during the project, and that was the Car Dealership next to the warehouse. We determined, as to not damage the cars, that we would apply our Sprayfoam only on days with very light or no wind to prevent overspray. We worked on the weekends when weather conditions were favorable for us. Our spray foam coating provides ultimate protection from a wide variety of weather conditions, including hail, snow, water, and ice. Our spray foam solution is self-flashing, which even further eliminates all seams and cracks and prevents leaks from occuring. There are no seams for air to escape from, this adds to the insulation protection, and is guaranteed to stop all leaks. Outstanding results, superior protection, and lots of money saved. Since the application of spray foam, Veritas has experienced no leaks. This stopped all shut-downs and any damage to products. Snowmelt is a terrible enemy to roofs, especially in Michigan. Since the application of spray foam, snowmelt issues, and ice-dam build-up has been eliminated. And we’re keeping the heat in their building during the cold months. Spray foam is absolutely incredible, and with our solution, we were able to improve the energy efficiency of the HVAC systems in the buildings and help keep the conditioned air inside. You know, where it belongs. We saved them $85,000 in roofing tear-off labor and disposal costs. ANd to top it all off, they’re well on their way to save an average of $31,675 annually in energy costs. Interested in the same? Get a quote.